U.S. 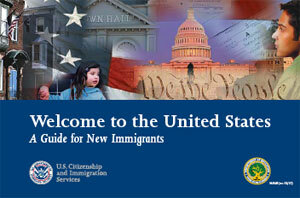 Citizenship and Immigration Services has a guide for new lawful permanent residents. This updated Spotlight takes a close look at the 2006 statistics on foreign nationals admitted for/those who adjusted to lawful permanent residence (LPR). One of the most commonly used publications on U.S. immigration statistics is the Yearbook of Immigration Statistics, published by the Department of Homeland Security's (DHS) Office of Immigration Statistics (OIS). acquired U.S. citizenship (ie, naturalized). The Yearbook also presents information about DHS's immigration law enforcement activities during a fiscal year. To expedite the release of the immigration data, in 2004 OIS started publishing Annual Flow reports on the number and characteristics of the above-mentioned groups of foreign nationals. This Spotlight uses data from both the Yearbook and Annual Flow reports. According to U.S. immigration law, immigrants are persons lawfully admitted for permanent residence in the United States. The law provides for three general immigrant categories: family reunification, employment sponsorship, and humanitarian cases (refugee and asylum adjustments). The total yearly inflow of immigrants in these categories is composed of both new arrivals to the United States and status adjusters. 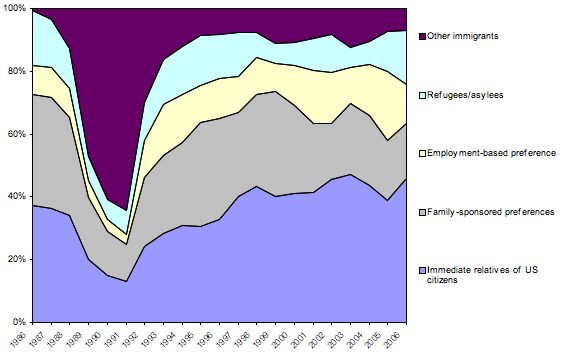 The number of new arrivals remained relatively stable at about 400,000 annually between 1986 and 2006. During 2006, nearly 1.3 million people were granted lawful permanent resident status. Family reunification accounted for more than 63 percent of all lawful permanent immigration in 2006. Employment-preference immigrants accounted for nearly 13 percent of all lawful permanent immigration in 2006. In 2006, about 17 percent of all lawful permanent residents were status adjusters who entered as refugees or asylees. There were about 88,000 "other immigrants" in 2006. More than 6.4 million foreign nationals submitted applications for the 2008 Diversity Lottery. Mexico, China, the Philippines, India, and Cuba were the top five countries of birth of lawful permanent residents in 2006. 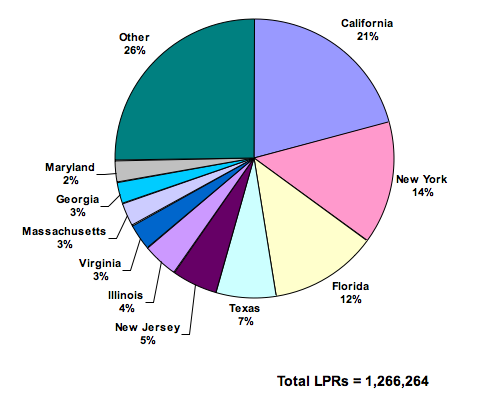 California, New York, Florida, Texas, New Jersey, and Illinois were the key destinations for many LPRs in 2006. Also known as "green-card holders," immigrants are persons lawfully admitted for permanent residence in the United States. The Department of Homeland Security Office of Immigration Statistics (OIS) also refers to immigrants as aliens who are granted lawful permanent residence (LPR), aliens admitted for lawful permanent residence, immigrants admitted, and admissions. In contrast, foreign students, H-1B workers, and tourists are part of the large category of temporary nonimmigrant admissions. The majority of people who wish to obtain lawful permanent residence or a "green card" in the United States qualify because they are a family member of a U.S. citizen or lawful permanent resident, the employee of a U.S. company, or a refugee or asylum seeker who has been granted protection in the United States. The number of all immigrants admitted to the country shown in the immigration statistics tables consists of two different types of flow. One is newly arrived lawful permanent residents—persons who were issued immigrant visas by the Department of State overseas. The other is status adjusters—persons who enter the United States in one legal status and then adjust or change to permanent residence while in the country. For example, a person arrives in the United States on a temporary worker H-1B visa. If her company chooses to sponsor her for permanent residence, the employer can petition U.S. Citizenship and Immigration Services (USCIS) for a green card on behalf of the worker under an employment-preference visa. If she meets the criteria, and if annual numerical ceilings for employment-preference visas have not been met, she will receive a card stating she is lawfully admitted for permanent residence. She is counted as a status adjuster for that year. Although the number of adjustments has greatly varied between 1986 and 2006, the number of new arrivals has remained relatively stable at about 400,000 per year (see Figure 1). Processing problems with adjustments and backlogs at the former Immigration and Naturalization Service (INS) and the current USCIS are primarily responsible for wide fluctuations in the total numbers. Source: Yearbook of Immigration Statistics 2006. There were 1,266,264 immigrants who were granted legal residence in 2006. Of those, 447,016 (35.3 percent) were new arrivals who entered the country in 2006, and 819,248 (64.7 percent) were status adjusters. The status adjusters arrived in the United States in any year before 2006, but their applications were approved during 2006. Immigrants who obtained green cards as relatives of U.S. citizens (580,483) and lawful permanent residents (222,229) accounted for 63.4 percent of all lawful permanent immigrants (see Figure 2). With the exception of the 1989 to 1994 period, family-based immigration since the mid-1980s has accounted for about two-thirds of total lawful permanent immigration. The share of immediate relatives (spouses, children under 21, and parents) of U.S. citizens varied between 13 percent (237,103) in 1991 and 47.1 percent (331,286) in 2003. Family-preference immigrants include nonimmediate relatives (adult children and siblings) of U.S. citizens and immediate family members of lawful permanent residents (spouses and children). Their share varied between 11.8 percent (216,088) in 1991 and 35.4 percent (212,939) in 1986. The 159,081 immigrants who received green cards through sponsorship from their U.S. employers accounted for 12.6 percent of all LPRs. The share of employment-preference immigrants is significantly smaller than that of family-based immigrants and has varied between 3.3 percent (59,525) in 1991 and 22 percent (246,878) in 2005 (see Figure 2). However, 87,702 (or 55.1 percent) of the employment-sponsored immigrants in 2006 were spouses and children of principal applicants. Refugees and asylees who adjusted their status to LPR in 2006 constituted 17.1 percent of all lawful permanent immigrants. 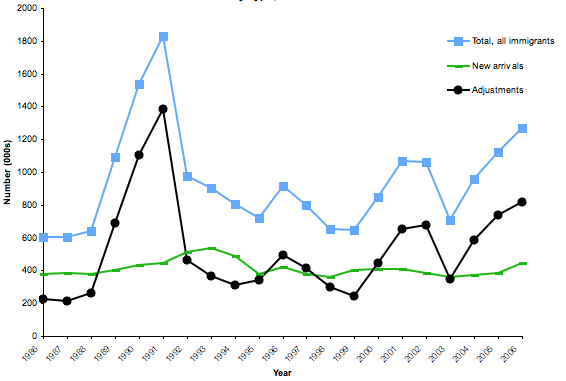 The number and percentage of refugee/asylee adjustments of status varied significantly between 1986 and 2006, from 6.3 percent (97,364) in 1990 to 17.3 percent (104,383) in 1986 (see Figure 2). Refugees are eligible to adjust to LPR status, without regard to numerical limit, after one year of residence in the United States. Similarly, asylees have to wait one year after they are granted asylum to apply for LPR status. Until 2005, there was a limit of 10,000 asylee adjustments per year. The Real ID Act of 2005 (enacted into law in May 2005) eliminated this 10,000 numerical limit. The number of asylee adjustments in 2006 (116,845) was 10 times higher than in 2004 (10,217). Less numerous groups of immigrants, such as persons and their dependents who legalized under the Immigration Reform and Control Act (IRCA) of 1986, parolees, and Diversity Visa Lottery winners, are examples of "other immigrants." In 2006, there were 88,017 "other immigrants" who accounted for 7.0 percent of all lawful permanent immigrants. About 96 percent (1,123,162) of the "other immigrants" group in 1991 were people who became LPRs under IRCA (see Figure 2). In contrast, 50.5 percent of the "other immigrants" in 2006 (44,471) were people who received their immigrant visas through the Diversity Immigrant Visa Program, also know as the Green Card Lottery. The Immigration Act of 1990 established the Diversity Visa Lottery (also known as the Green Card Lottery) to allow the entry to immigrants from countries with low rates of immigration to the United States. The act states that no more than 55,000 diversity visas are made available each fiscal year. Of the 55,000 visas, 5,000 have to be used for applicants under the Nicaraguan and Central America Relief Act of 1997, thus reducing the available number to 50,000. The visas are divided among six geographic regions (Africa, Asia, Europe, North America, Oceania, South/Central America, and the Caribbean), with no single country receiving more than 7 percent of the available diversity visas in any one year. Nationals of countries with high rates of immigration to the United States, such as Mexico, India, Canada, and China, are not eligible to participate in the lottery. Before receiving permission to immigrate to the United States, the lottery winners have to provide proof of a high school education or its equivalent, or show two years of work experience (in an occupation that requires at least two years of training or experience) within the past five years. They also have to pass a medical exam. The top five countries of birth — Mexico, China, the Philippines, India, and Cuba — accounted for 35.0 percent of all persons who received LPR status in 2006. Nationals of the next five countries — Columbia, the Dominican Republic, El Salvador, Vietnam, and Jamaica — added another 13.3 percent of all LPRs so that the top 10 leading countries of birth made up almost half (48.3 percent) of the total (see Table 1). Similarly to 1996, the top 20 countries of birth in 2006 accounted for about two-thirds of all LPRs (see Table 1). Seventeen of the 20 countries on the list in 2006 were also on the 1996 list. Poland, Russia, and Taiwan dropped off the list, while Guatemala, Brazil, and Ecuador joined it. Poland and Russia were on the list as recently as 2005. California was the intended state of residence for 20.9 percent of all admitted LPRs in 2006. Other leading states of intended residence included New York (14.2 percent), Florida (12.3 percent), Texas (7.0 percent), New Jersey (5.2 percent), and Illinois (4.1 percent). The top 10 states of destination—which also included Massachusetts, Georgia, Pennsylvania, and Virginia—accounted for 74.6 percent of all LPRs (see Figure 3). The Yearbook of Immigration Statistics and Annual Flow Report. Available online. Definitions of terms can be found at the website of the Office of Immigration Statistics. Diversity Visa Lottery 2007 (DV-2007) Results. Gretchen Reinemeyer is a former intern at MPI.